Stitches used: ch, sl st, sc, Hdc. ROW 1: With MC, ch 18, hdc in 4th ch from hk and in each ch aacross. Ch 2, turn. ROWS 2-12: Hdc in each hdc. Ch 2, turn. ROWS 13: Hdc in each hdc. Fold piece with right sides tog so Rows 1 and 13 meet. 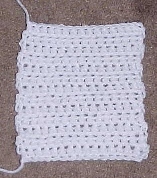 Join yarn at one folded side through corresponding stitches. Sl st through all corresponding stitches to close end. Repeat for opposite end. Attach CC in any stitch around opening. Sc in each st around opening. Join with sl st in 1st sc made.